The third decade of my life was without a doubt the most unpredictable, the most wondrous, insanely gratifying period of my life. It began my senior year at Roberts Wesleyan College. The cast of characters in my life remained essentially the same except for the appearance of – her. I was determined to play out my senior year in college like a grand finale at the end of fireworks display. Out of the starting gate I ran on the RWC varsity cross-country team. We were an unusually close-knit team and often participated in group social activities. Wouldn’t you know it, she happened to be there. one of the lead characters in the all college play. As busy as I was during that time, I always seemed to be running into her. At some point that fall I started taking an interest in her. She took her sweet time acknowledging my interest. Finally, she agreed to go out on a date with me if I was able to run a personal best time in our last home cross-country meet (a sub 30-minute race for a distance of 5 miles for you running enthusiasts out there). For me, the race itself was a journey to hell and back but more important than our team winning the meet was my prize, a date with her. semester. Our letters deepened our mutual affection, and each of us hinted of a future together. A flame was now lit within my heart and it danced wildly like a flame on the bare wick of a candle fighting to stay ablaze as it burns itself down to the renewing and sustaining body of the candle wax below. I became engaged to Patty in the spring of the following year at my parent’s home. Immediately she was welcomed into the family. Patty called home to notify her parents. If memory serves it was around midnight when she placed the call. “Mom, I’m getting married,” she told her parents. “To who?” Her mother asked, not expecting news of this sort at this hour of the night. “When are we going to meet this boy?” Her dad inquired, wondering what in the world was happening. The thought of inheriting another set of parents was something I hadn’t put a lot of thought into until that moment. I had just about finished separating myself from my own parents and now I was inheriting another set. Never in my life had I been this nervous about something, but then again never had I been more in love either. Sweat pooled under my armpits as I sat in an empty living room waiting for her father to come out and meet me. The sound of water running in the bathroom shower indicated it wouldn’t be anytime soon. Patty and her mom were off in another room having a mother/daughter reunion of sorts. When her father finally came out and laid eyes on me for the first time, our conversation went something like this. “Hello, Mr. Pickering.” I said warmly trying to hide my nervousness. Several years later Patty and I had the means to build our own home. It was during that time we entered into what I call the Noah’s ark phase of our lives, acquiring fresh and salt-water aquariums, birds, cats and a dog. The Lord soon blessed us with two boys, which we taught to fish among other things. They experienced the thrill first hand of having unseen objects tug on their fishing line as they dangled a worm on a hook into the watery abyss. Eyes went wide when they reeled in their prize. One son wanted to catch “chomper fish” after seeing his daddy bring home a northern pike. In the previous decade of my life I used the example of fresh-water fish viewed through an aquarium to portray the beauty of relationships. The example just doesn’t seem adequate now that I’ve experienced a slice of heaven here on earth. More fitting of this decade is the unfathomable splendor of gazing into a salt-water aquarium, which Patty and I have had the pleasure of setting up together. The personal cost to acquire and retain such beauty is far greater, the care more delicate and tedious, the hardships more severe but the final result is breathtaking. To this I would add, the result of just being with her is priceless. This entry was posted in Devotional, Living, Writing and tagged Aquarium, Bill Roushey, college, cross-country, Devotional, Fishing, love, Roberts Wesleyan College, running, RWC, salt-water fish, writing on August 22, 2015 by roushwm. The August sun beat down on Dad and me as we waited for the fish to surrender or make another run for it. Impatience bubbled up inside me. Holding on to my fishing pole kept both my hands occupied but the rest of my body squirmed, longing to do anything but remain pinned against the sun baked boat seat. The life vest hanging around my neck made me hot and sweaty. It started to smell rotten as it wicked up the moisture from my body. My standoff with the fish showed no sign of ending. It was becoming evident that the huge northern pike had done something to prevent me from reeling it in. Now, my head hurt and I was ready to give up. My father was not ready to give up. An engineer by profession, part of his job involved coming up with solutions to problems. He took an oar out of the oarlock and pushed it into the water following the fishing line down, hoping to gain some understanding of why I couldn’t bring up the fish. Unfortunately, the depth of the water exceeded the length of the oar. Then, he began rowing the boat in a wide arc around the spot where the line plunged into the water. He stopped four or five times during the trek to give me a chance to pull on the line from different angles. Nothing he tried worked. We both knew there was only one thing left to do. Fish or fishing in my earliest years validated the idea that just because something couldn’t be seen it didn’t mean that something didn’t exist. Fish, though unseen, were real and could be interacted with. To this day one of the most exhilarating things about fishing is the feeling of an unseen object tugging on your line. Being a person of faith, the picture of unseen fish models the existence of God who is present though not seen. (2 Corinthians 4:8). In my second year in college I happened to meet a freshmen who turned out to be a very funny guy. I don’t make it a habit of hanging around comedians but for some reason we hit it off and become good friends. He made me laugh more than anyone I knew. Our definition of fun, however, sometimes clashed with our college rules. I’ll call him Boris to protect his identity. Boris and I made plans to room together our senior year. Oops, I just gave away his identity. Anyway, we arrived early on campus in the fall and immediately began decorating our senior “bachelor pad.” Because we arrived early, we were able to pillage the best room furnishings out of nearby dorm rooms. Conversations between us went something like this. This was 1979, before the widespread use of cell phones, personal computers, flat screen TVs and all of the game consoles we can’t live without except for maybe Atari. “How about a lamp?” He said chuckling as only Boris could. His cackle was contagious he soon had me laughing. “What does Jim have that we don’t?” I said. Each floor in our dorm had a resident advisor, or RA, who was the liaison between the students and the dorm’s resident director, or RD. Boris was permitted to enter rooms on our floor as part of his responsibilities. Tentatively, I entered Jim’s room and Boris followed. I can’t remember exactly how we acquired a fish tank, but I’m sure we did it legally. Putting fish in an aquarium drew me closer to them where I could fully appreciate their beauty. I felt like I was one of them as they swam by me at eye level while I sat working at my desk. It’s a much different prospective than viewing fish from afar or looking down at them from above. I would characterize this decade of life as the discovery of genuine relationships. These were more personal and fulfilling than the juvenile ones of my earliest years. I fully immersed myself in these relationships and learned the joy of putting effort into them rather than just taking what I could and moving on. This entry was posted in Devotional, Living, Writing and tagged Aquarium, Devotional, Dorm Life, Fishing, Roberts Wesleyan College, RWC on August 15, 2015 by roushwm. As I stumbled around my bedroom getting ready for work, I had no clue that inspiration was about to spring on me. I placed my wife’s coffee on her nightstand as a beeping alarm clock roused her from sleep. Being thoughtful, I shuffled across the floor to her aquarium thinking its light would be easier on sleepy eyes. The instant the tank flooded with light the epiphany came. I felt the need to write about fish. What? I questioned the thought immediately wondering what writing about fish swimming in an aquarium had to do with anything other than lowering someone’s blood pressure. Immediately, I concluded two things. This thought had nothing to do with work since I am not a commercial fisherman, nor was it about food, because I don’t normally think of ordering a fish fry immediately after eating breakfast. I left the house confused. I arrived at work and began making my way through the building. Robotically, I turned on a light to illuminate the corridor I had walked down a thousand times. On my left I noticed an expanse of blue paper hanging on the wall. Pasted on the paper was an assortment of hand-colored fish straight out of a coloring book. I wondered how long it had been there. Another light revealed more fish. Hmmm. I made my way to my desk. Certainly a cup of coffee would help me think more clearly. I retrieved my thermos and a nearby coffee mug and placed both items on my desk. I flicked on the overhead light and sank into my chair already anticipating the positive effect pouring hot black liquid down my throat would have. As I reached for my cup, I noticed a card lying on the desk beside it. Believe it or not it was a subscription card to the “In-Fisherman” magazine. My immediate thought was, you’ve have got to be kidding me. I seemed to have just experienced a three-fold affirmation to write about fish. Since I subscribe to the belief in a Divine Being who works in all areas of my life, I resolved to give the subject matter a bit of serious thought. I reflected on what I had to work with. All three instances involved fish-related subject matter already present in the darkness and appeared visibly when I turned on a light. I spent the rest of the morning physically working on maintenance projects while my mind tried to determine what direction to take this project. I began by tapping into my earliest memories of fish or fishing. Several hours later I had a shirt pocket stuffed full of notes written on paper scraps spanning six decades. Here’s what I came up with. During the first ten years or so of my life, going fishing with my dad would definitely make the highlight reel. Our family began taking vacations to Canada about that time. Somehow my parents managed to get in touch with a farmer who rented out a pair of cottages on a private lake. My most special memory while staying in one of those cabins involved Dad taking me out fishing early in the morning before my brothers and sister woke up. One thing became apparent during these outings; Dad could fish for hours even if the fish weren’t biting. Like any kid, I had a limited attention span so I had to find ways to fight off boredom if I wanted my imagined exclusive fishing rights with Dad to continue. The following is a vivid memory of one of those periods of boredom. It was late morning, I had already finished my peanut butter and jelly sandwich but my stomach continued to growl. 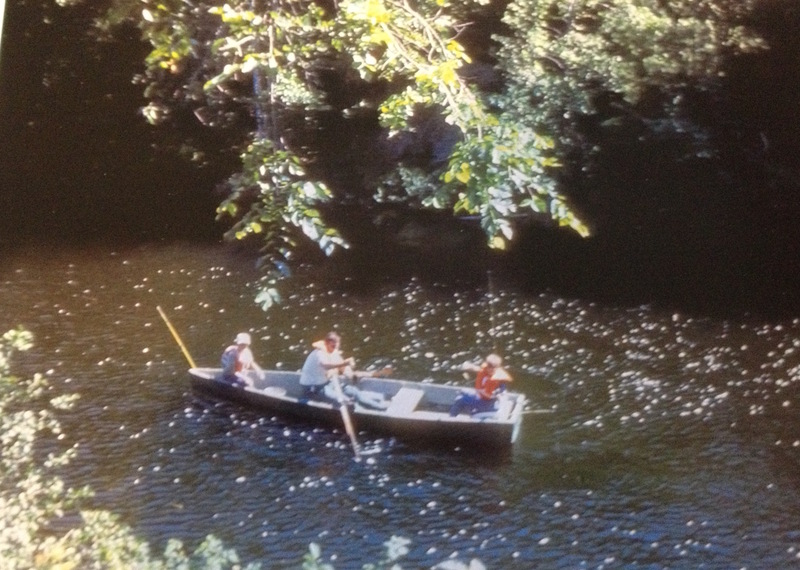 I remember boredom biting me as I sat in the front seat of a small aluminum rowboat we were fishing out of. I decided to make a game out of leaning over the side of the boat and trying to get my face as close to the water as possible. My father was oblivious to this folly as he occupied the middle seat and had his back to me. It was hard leaning over the side with a faded orange lifejacket on but I somehow found a way to do it. I added interest to the game by grabbing my fishing pole and dangling a lure in the water close to my face. I used the same green rubber frog I fished with all morning without success. That was probably the reason I got bored in the first place. The frog appeared lifelike as I manipulated it with the fishing rod. I stared into the dark water as I played. I was not holding my fishing rod properly when a pair of ghostly eyes bracketing a large gaping mouth full of teeth ascended out of the darkness and inhaled the rubber frog as it bobbed just below the surface less than a couple feet from my face. Immediately, the mammoth northern pike disappeared back into the blackness without the slightest splash. His words did nothing to quell my excitement, however, as I watched the tip of my pole bend down into the water. The fish swam away from the boat taking fishing line with it and I could do nothing to stop it. Dad got excited when he saw what was happening. He spun around quickly to face me. “Don’t pull to hard, you might snap the line,” he replied. The fish suddenly stopped moving away. My line, taunt as a guitar string, felt as if I had the anchor tied to it. “Dad, it won’t budge,” I said growing frustrated. My father never attempted to take the fishing pole from me; he concentrated instead on offering me encouragement. He decided to row the boat towards the fish to take some of the pressure off the line. We left the middle of the cove overrun with lily pads and edged closer to a rocky bank that tumbled into the lake. He stopped rowing when the fishing line ran straight down into the water. The only evidence that something was still on my line was an occasional heavy tug against the thin strand of monofilament fishing line. We had reached a stand off. The fish wasn’t moving and I couldn’t make it move. “Billy, he may have wrapped himself around something on the bottom,” Dad offered. 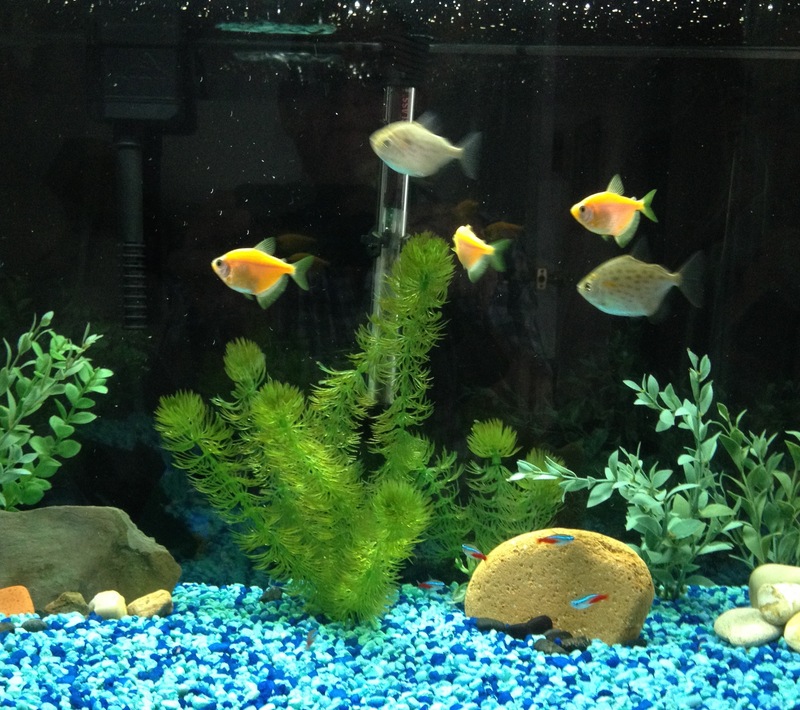 This entry was posted in Devotional, Living, Writing and tagged Aquarium, Fishing, vacation on August 8, 2015 by roushwm.